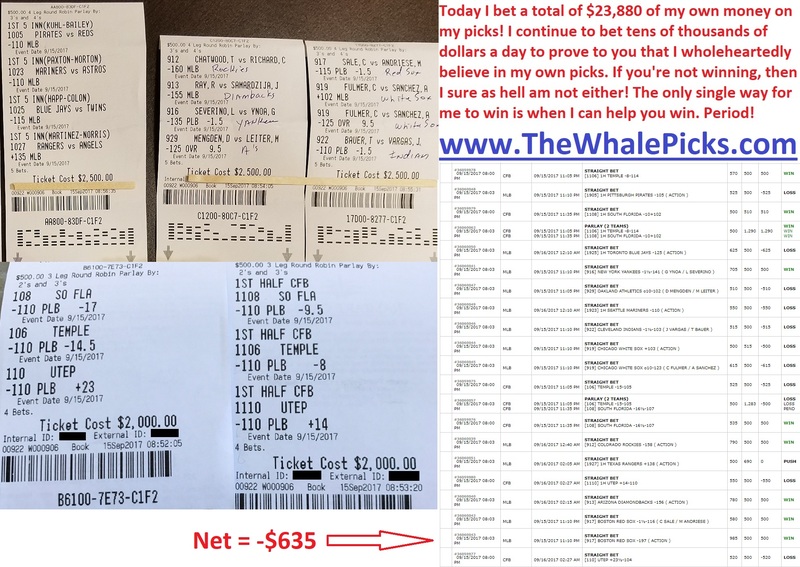 Home The Sports Betting Whale Just Bet $296,877.60 and Cashed out $369,547 for a Winning Profit of $72,669 in 7 Days! 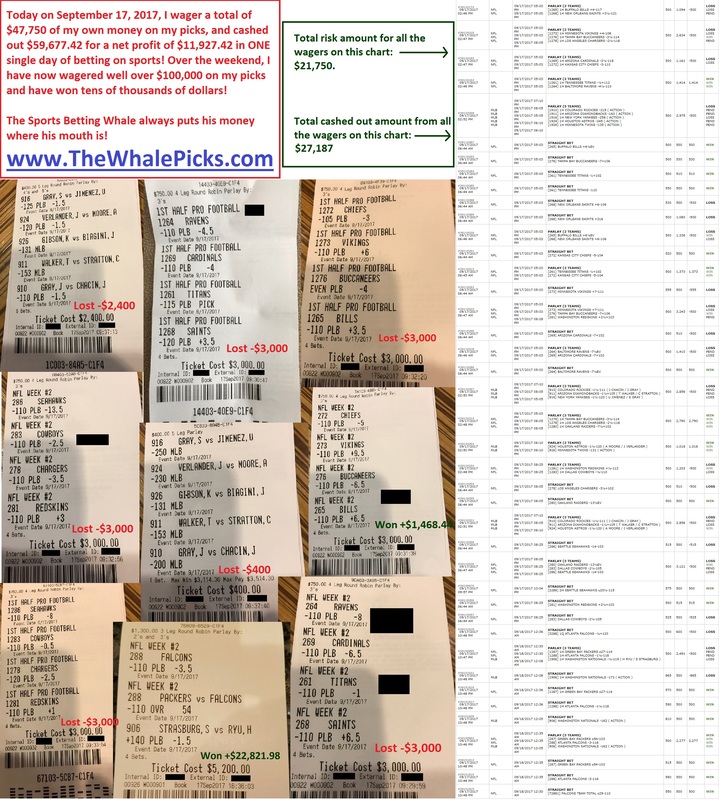 The Sports Betting Whale Just Bet $296,877.60 and Cashed out $369,547 for a Winning Profit of $72,669 in 7 Days! 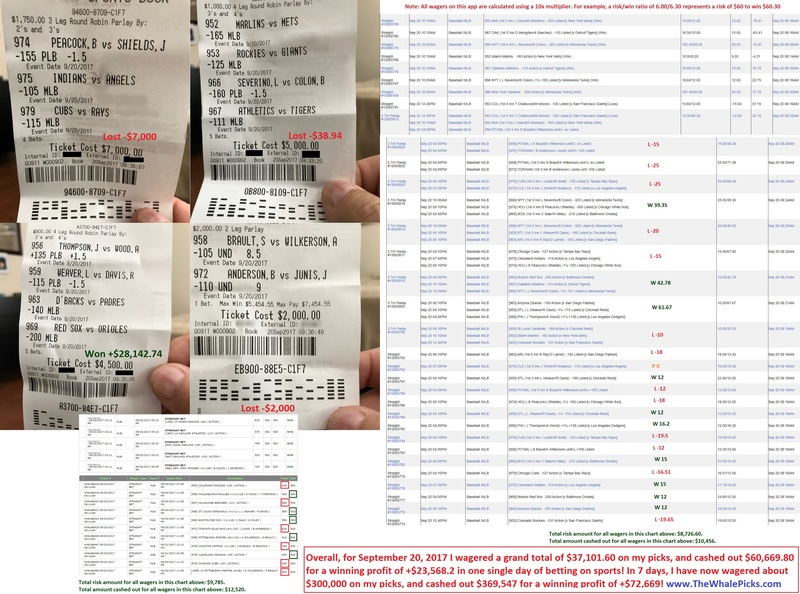 In just 7 days, I put almost $300,000 of my own money where my mouth is, and ended up getting paid out $369,547 for a winning profit of $72,669. You’ve now literally seen it with your own eyes. How’s making more than $72,000 in a week sound? And I’m not done yet. I’m not satisfied yet. I can’t wait for the days when I can show you how I’ll win hundreds of thousands of dollars or more in one single day once the patterns align. I know that action speaks louder than words. I didn’t just sit back and tell you how my picks could make you money. 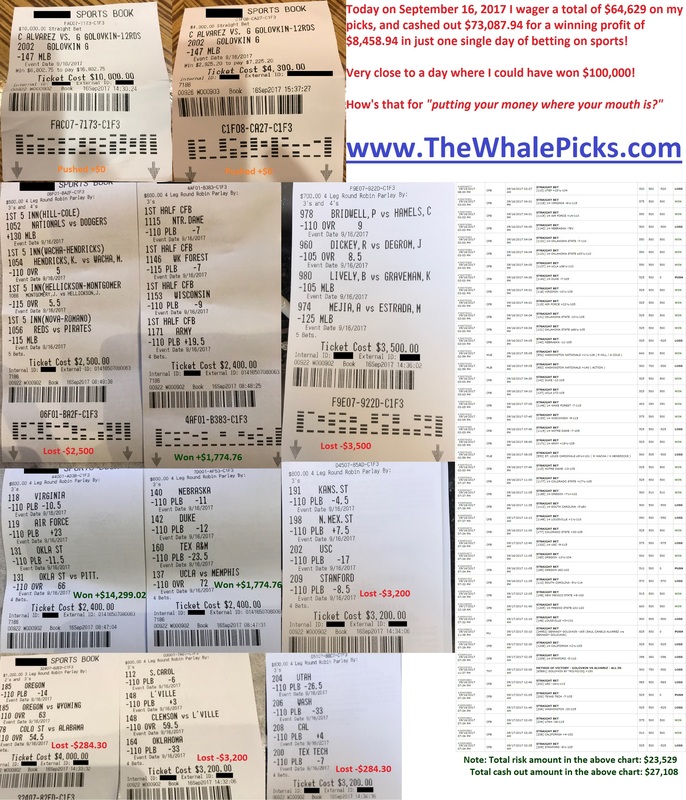 I went out there and risked nearly $300,000 of my own money on my picks over the last week because I know it’s far more compelling for me to show you that I can win than just simply tell you how I can win. That’s what makes me different from the typical touts you always find in this business who only talk the big game, but can’t put their money where their mouths are. It’s important for you to know that I wager along with you by the tens of thousands a day because that’s the only way for you to know with certainty that I have your best interest at heart. 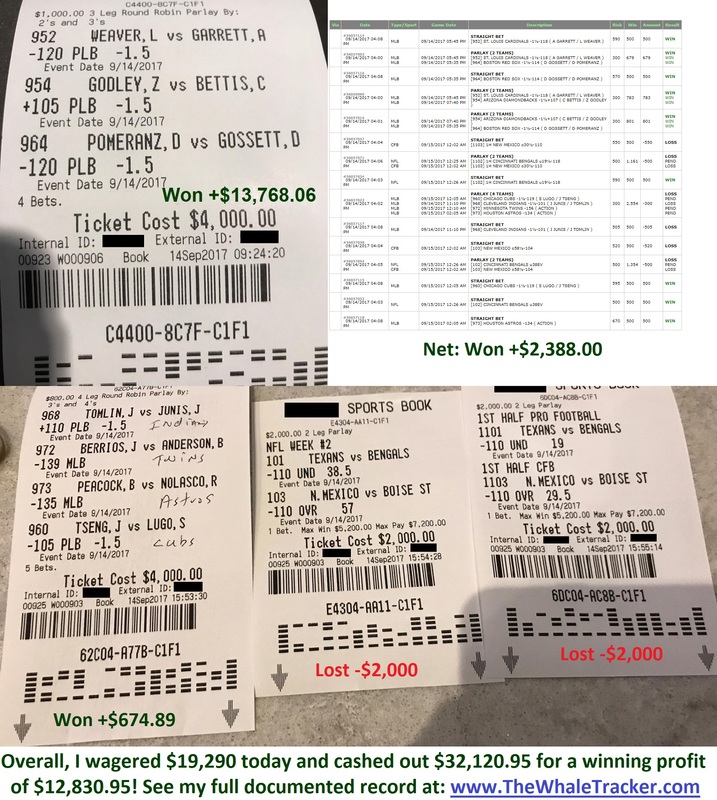 Since I put up hundreds of thousands of dollars of my own money on the line every week on the same picks that I share with you, that is literal proof of how the only way I can possibly profit from this program is when I can help you win. If you’re not winning, I’m not winning. Every time you lose $100 betting on my picks, I’m probably losing $1,000. Every time you win, I’m also winning. We’re in it together. 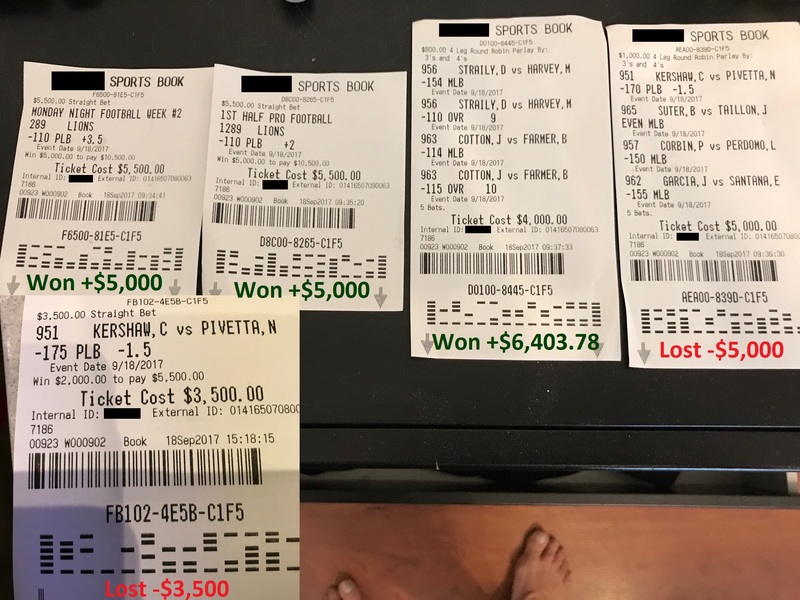 I continue to bet hundreds of thousands of dollars each week because there’s no better way for me to prove to you that my picks and system works than to actually go out and risk hundreds of thousands to millions of dollars of my own hard-earned money on the same plays I share with you. There is literally no doubt: I have to perform and win for you, otherwise I do not have anything to gain. Not only do I put my money where my mouth is, I do it by the hundreds of thousands of dollars weekly. 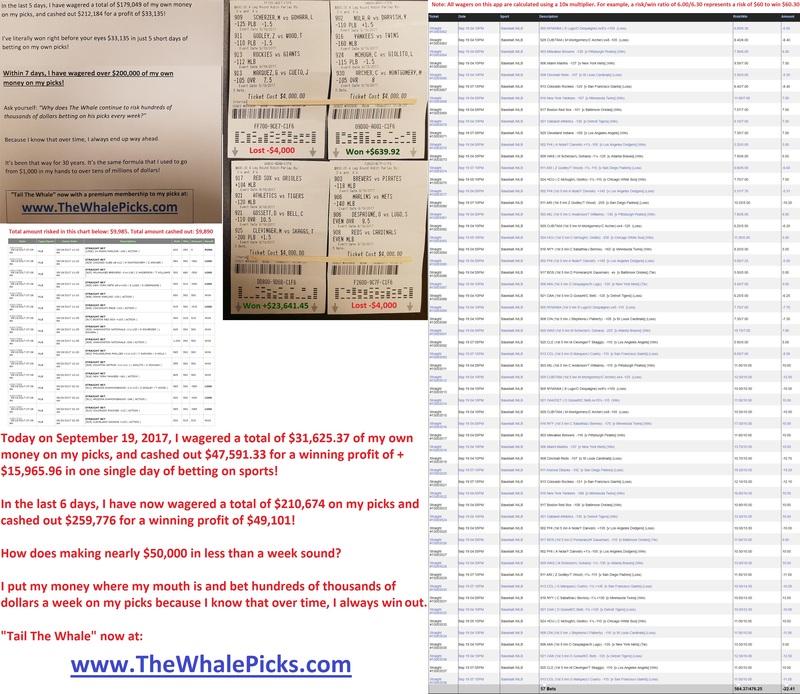 Right now, I am currently on track to betting millions dollars of dollars in a month period. If the patterns continue to form, you’ll see me bet a million dollars in a week soon. This is the time of year when I have historically gone on my mega winning streaks. That’s because the combination of NFL, college football, baseball, MMA, and very soon hockey, NBA, and college basketball all come together to form a perfect storm to where I have historically gone on my million-dollar runs. You remember my 2-month run from April 21st to June 21st where I was up about 1,000 base units. Well, I have a strong hunch right now that I’m right on the start of another 1,000-unit winning run. So strike while the iron is still hot. The time to jump in is now. If you’ve been sitting on the sidelines waiting for me to get hot, here’s your opportunity to come aboard.